Back in my day, we didn’t have many options for Valentine’s day cards. My mom used to take my sisters and I to our local Kmart and we would pick out favourite Valentine’s day cards from their small selection. I carefully checked each one over and tried to pick one that I hoped would be unique. It was annoying when another kid was handing out the same cards as me. However, it happened every year. When you live in a small area, your options are limited. Fast forward 30 years and I’m back living in that same rural area, but things have changed. A lot. Thanks to the Internet, we have choice at our fingertips. Literally. You can still head out to your local Walmart or Kmart, if you live in an area that has that still has the store (ours doesn’t). You can also buy Valentine’s day cards online at Tiny Prints or Shutterfly. Better yet, get your child’s Valentine’s day cards for FREE online. I have some here today for you to use! 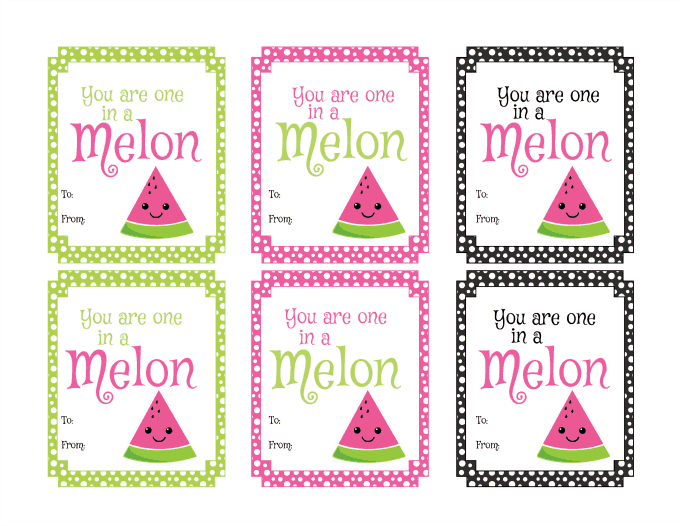 These Valentine’s day cards are cute and lovable watermelon themed that lets the recipient know that he or she is “one in a melon”. Download the pdf to your computer and print them out for free at home. All you need is paper, ink and a printer. Use as many copies as you need. More than likely, your child will be the only kid in the class to have these cards to hand out. Try something different this year and save money! My daughter, Bridget, will be using these Valentine’s day cards to give out to her school friends. We are going to put them in little envelopes too and decorate it with stickers. For more Valentine’s day themed crafts, check out my Valentine’s Day Flower Vase, Valentine’s Day Picture Frame and DIY Valentine Box. 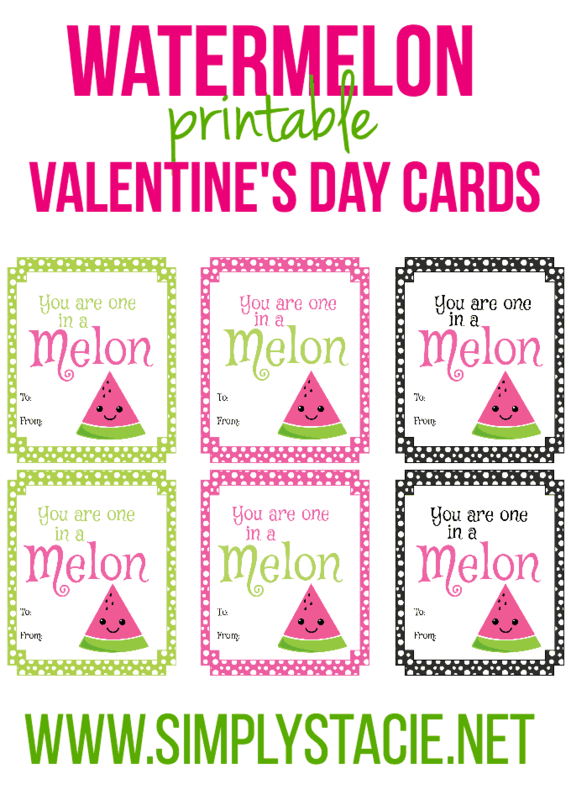 Fill out the form below to get these Watermelon Valentine’s Day Cards delivered right to your inbox. Where do you find your Valentine’s Day cards? These are beyond cute! I Love the sayings on them and so great that they can be printed out on thick, colored paper! 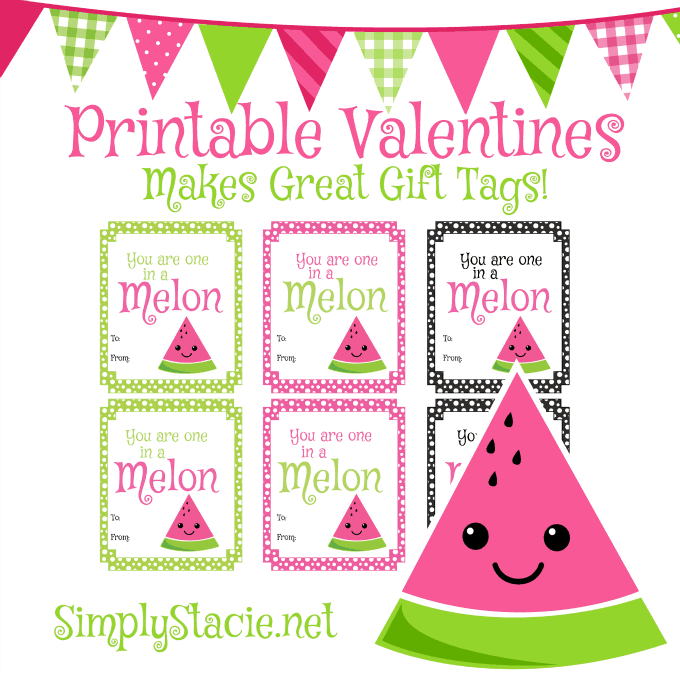 I usually just pick them up at Walmart, but these Printable Valentine’s cards are so adorable! I need to print some of these out! These are cute valentine’s day cards. These are really cute, I think I am going to print them out and use them for my grandkids!! Those are the cutest thing I have seen in a long time! Those are cute cards. I don’t remember where we got our Valentines (this was 60 years ago) . Oh my goodness! These are so very cute! Just adorable! Pinned! Thanks for sharing!! Sooooo cute! Thanks for sharing at Submarine Sunday!! So good! I’m using these for invitations to a backyard party. I changed it up a bit..they’re perfect. oh how cute are these!!! !